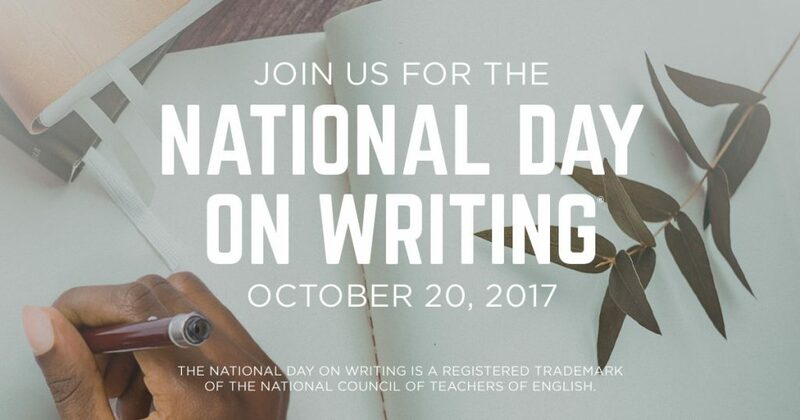 The written word is getting lots of love as people put pen to paper and fingers to keyboards for the National Day on Writing®. Now in its ninth year, this annual celebration is lifted up through tens of thousands of social posts to the #WhyIWrite hashtag. The National Council of Teachers of English began this annual event in 2009 to highlight the importance of writing. Whether we are sending text messages, posting status updates, crafting emails, or jotting down lists, writing has never been more central to our everyday lives. A rich website filled with writing resources, podcasts from renowned writers, and events across the country. A wildly popular tweet-up to the hashtag. Support from the US Congress with a bipartisan resolution sponsored by Senator Roberts (R-KS) and Senator Casey (D-PA) recognizing the National Day on Writing. Partnerships in the publishing community that produced video stories from such authors as Jamie Ford, Hart Hanson, Meg Gardiner, Jack Challoner, E. Lockhart and David Barclay Moore. Join the conversation and post your thoughts to #WhyIWrite today! The National Council of Teachers of English (NCTE) is the nation’s most comprehensive literacy organization, supporting more than 25,000 teachers across the preK–college spectrum. Through the expertise of its members, NCTE has served at the forefront of every major improvement in the teaching and learning of English and the language arts since 1911.